Old codger sitting on a porch at Old Bedford Village, Bedford, PA. While traveling back from a Jersey Shore vacation last week, we stopped at Old Bedford Village in Bedford, PA for their Wild West reenactment. 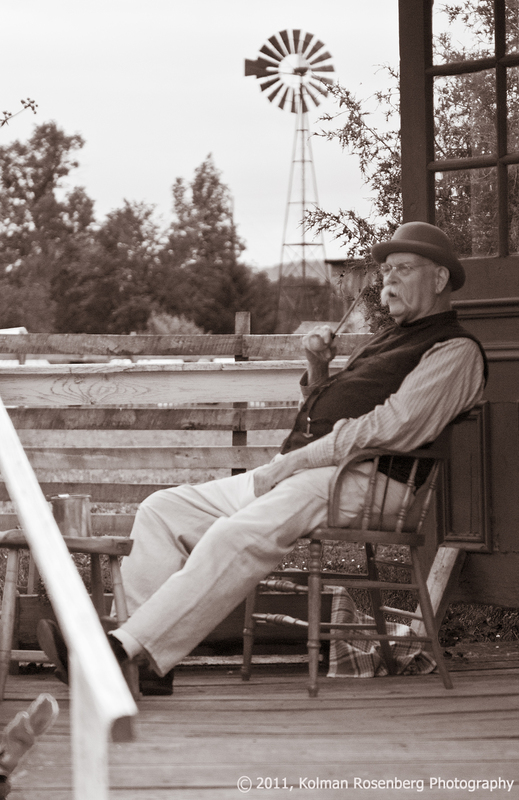 I saw this old codger sitting on a front porch, smoking a pipe and thought it would make a nice sepia toned photo. I particularly liked the windmill in the background giving it a true rural look. It was a beautiful, warm Sunday afternoon and this gent seemed to have the right idea. I wish there had been a few puffy clouds in the sky rather than this bald sky, but sometimes you just have to work with what you have. This entry was posted in Uncategorized and tagged bedford, codger, old, pa, pennsylvania, pipe, porch, relax, rural, sepia, tone, windmill. Bookmark the permalink. Dear Mr. Rosenberg, I would like to chat with you about the possibility of using this photograph for the cover of my new book, “The Art of Porch Sitting”. You may contact me below. Thank you for your time and the great photographs. Thanks for the nice comment Mr. Heirich. I will contact you.